We propose a paper exploring the friendship of Dorothy Sayers and C. S. Lewis. By examining the correspondence of these two Christian authors and by researching biographies, we intend to describe the nature of their friendship. Reviewing the letters chronologically will allow us to understand how their friendship developed and deepened over time. Considering the topics and themes most commonly addressed in the letters will provide insights into the common interests that brought them together as well as those topics on which they disagreed and debated (e.g. 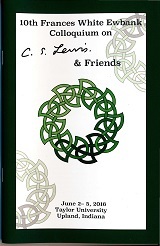 why Christians write and the controversy over the female priesthood in the Anglican church), for, as Lewis noted in The Four Loves, friendship has to be about something. In our initial review of the letters, we have been able to see signs of a developing friendship. For example, we can trace the closeness of the friendship through the salutations (from Mr. and Dr. Lewis to Jack, for Sayers), and we note Lewis's invitations for Sayers to have lunch with him when she visits Oxford. During her first term at Oxford, in 1912, Dorothy L. Sayers along with a friend, Amphyllis (Amphy) Middlemore, started a women's first-year student literary group which Dorothy named the Mutual Admiration Society for, "...if we didn't, the rest of College would." The mission of the society was to encourage one another's creative writing, and several of the women in the M.A.S. retained life-long friendships. One perspective may be to view this Oxford women's literary group, headed by Sayers, as an earlier but similar society to the later and more famous Inklings. The purpose of this paper is to take a closer look at the three years of the M.A.S., the student members, their friendships, their literary work, and their influence upon the writing and life of Dorothy L. Sayers. During the years 1912-1915, the society provided a safe environment for its women student members to share and encourage literary writing and offered the opportunity for these women to bond in friendship. The original letters, notebooks, and manuscripts of Dorothy L. Sayers which are housed at the Marion Wade Center in Wheaton, IL reference Sayers' M.A.S experience and provide the basis for my own research into her Oxford student years. What can save us from the soul-deadening life promised by current ideals of career success? Dorothy Sayers posits a "gospel of work" grounded in God's nature itself. God is essentially creative: "In the beginning, God created the heavens and the earth" (Genesis 1:1). In other words, we must create or become less than human. Sayers describes work in its creative vitality as "the outward and visible sign of a creative reality." Such sacramental language should encourage us in regarding our work as a sacramental act. In her essay Vocation in Work she goes so far as to assign our work a redemptive measure, as it is "the creative activity that can redeem the world" (90-91). Analyzing Sayers's views of work in Gaudy Night, "Vocation in Work," Why Work, The Zeal of Thy House, The Mind of the Maker and her letters will reveal that finding our vocation brings us to full creative vitality; it gives our soul life, it fulfills God's intention for our gifts and in some way forwards God's kingdom on earth (and makes us friends).